A ridge vent is a type of vent installed at the peak of a sloped roof which allows warm, humid air to escape a building's attic. Ridge vents are most common on shingled residential buildings. windy weather, the entire attic is vented by a constant flow of cooler, dryer outside air. When building or remodelling a house, it's common practice to provide some ventilation in the attic. Attic venting reduces the amount of heat that enters the house during hot weather, and keeps the roof shingles cooler which prolongs their life. Older homes often have nothing more than a louvered vent near the top of each gable wall. In the last 3 or 4 decades there has been increased attention to providing the right amount of venting that will function even when the wind isn't blowing. This often means using perforated soffit material at the eaves and some type of ridge vent at the peak of the roof, plus careful construction methods to ensure at least an inch of clear space below the roof sheathing to allow for air flow. This method works. Even with no wind, the hot air inside the attic will rise up and escape from the ridge vent, and cooler air will be drawn into the soffit vents. 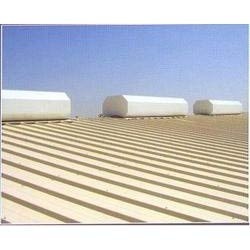 There are many roof ridge venting products available today. This article shows how one typical product is installed. With our in-depth expertise in the domain, we provide the customers with a premium quality Ridge Ventilators. Available with a bird screen, rain cap and continuously adjustable damper, these are also custom made according to the requirements of the customers. These are manufactured as per the defined industry defined standards and using premium quality raw materials. To provide our customers with a detect free range of products, our quality analysts stringently check these products on defined quality parameters prior to their final dispatch. For the purpose of installing multiple units in a continuous run, these are also offered with gutter splices and connector bar.